Days after listing Zcash to its crypto trading platform, Coinbase has released a list of 30 cryptocurrencies that 'are being explored' for a possible future listing. 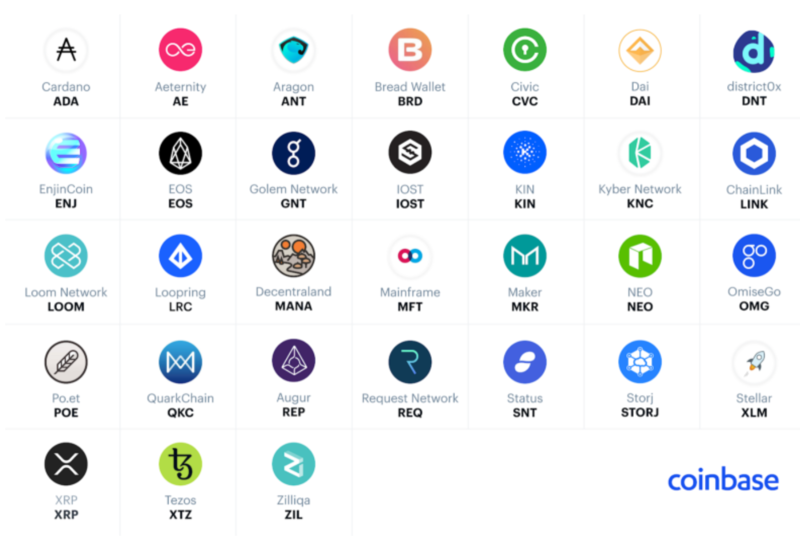 In alphabetical order by symbol those 30 digital assets are: Cardano (ADA), Aeternity (AE), Aragon (ANT), Bread Wallet (BRD), Civic (CVC), Dai (DAI), district0x (DNT), EnjinCoin (ENJ), EOS (EOS), Golem Network (GNT), IOST (IOST), Kin (KIN), Kyber Network (KNC), ChainLink (LINK), Loom Network (LOOM), Loopring (LRC), Decentraland (MANA), Mainframe (MFT), Maker (MKR), NEO (NEO), OmiseGo (OMG), Po.et (POE), QuarkChain (QKC), Augur (REP), Request Network (REQ), Status (SNT), Storj (STORJ), Stellar (XLM), XRP (XRP), Tezos (XTZ), and Zilliqa (ZIL). Earlier this year, Coinbase announced that it was looking into adding Cardano (ADA), Basic Attention Token (BAT), Stellar Lumens (XLM), Zcash (ZEC) and 0x (ZRX) to the platform. Three of those have been listed so far: BAT, ZEC and ZRX. Stellar and Cardano are still being monitored, as well as a number of ERC-20 tokens. Coinbase, that was trading Bitcoin, Ethereum, Litecoin and Bitcoin Cash before it started listing more altcoins, focuses on cryptocurrencies that are fully compliant with the local law. The company 'intends to offer customers access to greater than 90% of all compliant digital assets by market cap'. Coinbase will be working with local banks and regulators 'to add them in as many jurisdictions as possible'. VIDEO: Where will Bitcoin bottom out? Is Coinbase making steps in the right direction by listing more altcoins? I don't believe in any predictions of Coinbase. It was insolvent in insider trading earlier!! It so wrong decision to add doubtful coins. I think people don't believe them at all. Coinbase could worsen a reputation that is already bad.